History: Baxter’s owner must have known he was not racing material because he is not individually registered with the NGA. 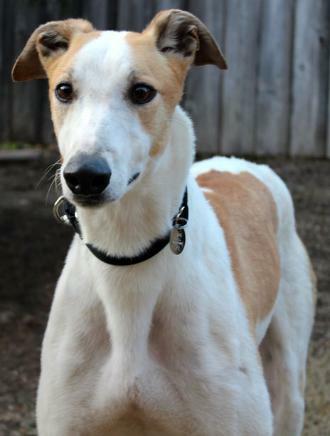 He had no races to his credit but is certainly ready to race to the nearest sofa. 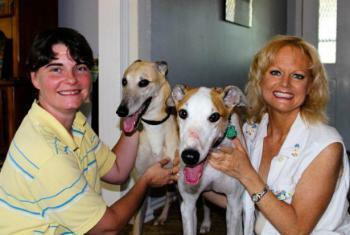 June 9, 2012 update: After three months Baxter was returned to TAGS because one of the children was allergic to him. His family wanted TAGS to know what a delightful dog Baxter is and to let people know that he is a "perfect" family dog. They had no issues with him. He is now looking for what he hopes is his lifetime home. 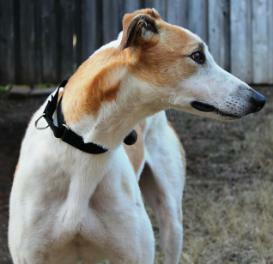 February 22, 2012 update: Baxter has spent almost two weeks in a foster home with a cat and another Greyhound. 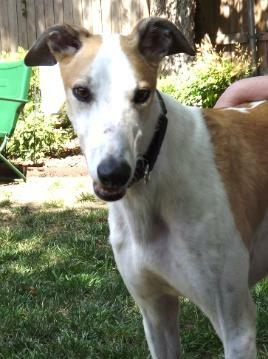 As expected, Baxter and the female Greyhound are good friends, happily playing in the yard and keeping each other company. Unfortunately, Baxter and the cat are another story. The cat does not want to get near Baxter, and Baxter tries too hard to actually get near the cat. It does not appear that Baxter and a cat will be good housemates. Otherwise, Baxter is settling into retirement in a home, even learning the stairs. We will introduce him to a small dog soon. February 12, 2012 update: It certainly took no time for Baxter to react to his name – maybe because it is close enough to “Box” which is what he was called previously. The reaction you get when you say “Baxter” is a tail wag – it’s like you turned on a switch. He’s a pleasant, outgoing boy. He slept all night on a dog bed in the bedroom and has had no accidents in the house (of course, he’s wearing a belly band). He was crated for a short time without incident. Baxter was cat tested as soon as we got him. He was a little too interested in the cats for comfort, but he will be cat tested again once he has settled into a home and is less stressed.